On December 21, 1937, Walt Disney Productions premiered Snow White & the Seven Dwarfs to an audience that was hesitant about a full-length animated feature. Beating box office expectations, the film earned $8 million internationally, becoming the most successful film of all time. Afterward, Disney continued to release one critically acclaimed film after another, from Pinocchio (1940) to Fantasia (1940) to Dumbo (1941). For roughly the next three decades, the studio made masterpieces that delighted the kid in every adult. But on December 15, 1966, the unthinkable happened: the “Old Mousetro” himself, Walt Disney, died, leaving behind a legacy of classics but an uncertain future for his animation studio. 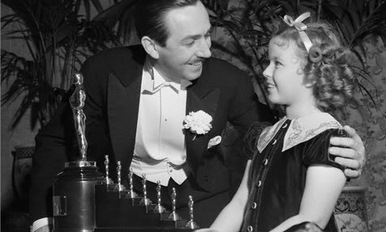 seven miniature Oscars – for Snow White & the Seven Dwarfs. In 1984, Walt Disney’s nephew Roy E. Disney brought Paramount Pictures’ former senior vice president Michael Eisner and one-time Warner Brothers chief Frank Wells as CEO and president of the company, respectively. Eisner’s Paramount colleague Jeffrey Katzenberg also arrived, as Disney’s new studio chairman. During an initial meeting at Disney, Eisner instructed Katzenberg to revitalize the company’s animation department. Since Walt and his team of “Nine Old Men” were no longer at the studio, it was struggling to develop projects with the same masterful storytelling of its earlier years. Thus, Katzenberg chose Peter Schneider to represent Walt Disney Feature Animation as its first president. In 1985, Disney released The Black Cauldron. The film, which had been in development for about 10 years, failed to connect with critics and audiences. Disney fared better with The Great Mouse Detective (1986) and Oliver & Company (1988). Although Mouse Detective scored better reviews, Oliver grossed more than twice as much domestically. However, Disney still needed a new film to please both critics and audiences. Unbeknownst to the studio, it was about to get several. Courtesy of Mouse Detective duo Ron Clements and John Musker, The Little Mermaid arrived in 1989, ushering an era known as the Disney Renaissance. The following year, Hendel Butoy and Mike Gabriel’s The Rescuers Down Under became Walt Disney Animation Studios’ first feature sequel. The film was a financially successful response to its 1977 predecessor, The Rescuers, which once held the domestic record of highest opening for an animated feature. In 1991, Gary Trousdale and Kirk Wise’s masterpiece Beauty & the Beast opened with massive praise and became the first animated feature nominated for the Best Picture Academy Award. Clements and Musker then returned with Aladdin, the world’s highest-grossing film of 1992. In the midst of all this achievement, Disney carefully planned their next big musical. They felt confident the picture would earn critical acclaim and break box office records. With powerful music, captivating visuals from many of the studio’s top animators, and a story loosely based on a Shakespearean classic, Disney eagerly anticipated for this film to take the world by storm. The film was Pocahontas. Meanwhile, Disney was also developing a B-film about a boy in Africa, framed for murdering his father. With music by Elton John. 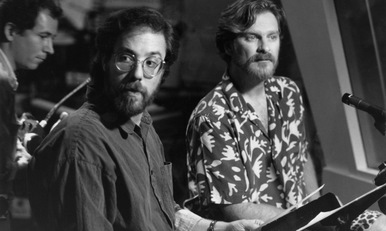 Rob Minkoff (left) and Roger Allers during the making of The Lion King. Over two days’ worth of meetings, Allers and Minkoff met with producer Don Hahn, as well as Beauty directors Kirk Wise and Gary Trousdale, to retool the film. “When I got involved, we were able to bring some of the more mythical and magical elements, like Mufasa’s ghost coming back to talk to Simba, which were not part of the film before,” said Minkoff. 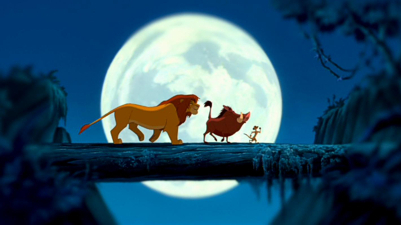 “Also, Rafiki as a character changed dramatically to become sort of a shaman witch doctor as opposed to what he had been previously, which was more of a politician.” In time, the filmmakers began to see similarities between their film and Shakespeare’s Hamlet, drawing inspiration from the latter work. Minkoff and Allers worked from a screenplay by Irene Mecchi and Jonathan Roberts, with revisions from Linda Woolverton. Brenda Chapman served as story supervisor. Thus, The Lion King was born. After approximately four years, Allers and Minkoff completed The Lion King. Eagerly, they waited to see the results of their labor. On June 15, 1994, The Lion King opened domestically with a limited release in two theaters. The film grossed $1,586,753 for a per theater average of $793,377, a record for largest per theater average during a weekend. 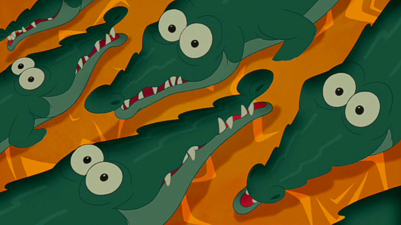 Reviews praised the film’s mature story, humor, and majestic animation. On June 24, 1994, The Lion King opened nationwide in 2,552 theaters and collected $40.9 million, achieving the record for biggest opening of an animation film. By the end of its run in spring 1995, the film had earned $312.9 million domestically. 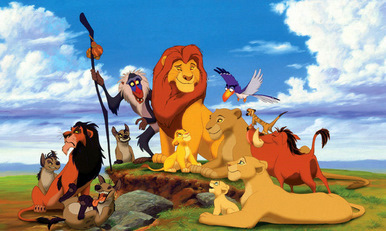 Worldwide, the film collected $784.7 million, becoming the #1 movie of 1994 and the biggest animated film of all time. Among the praise, The Lion King also found controversy. The film shard multiple similarities with Osamu Tezuka’s 1950 manga Jungle Emperor, more commonly known in the U.S. as Kimba the White Lion. While their stories were different, the works shared similar character designs and names. When he was hired, actor Matthew Broderick, the voice of adult Simba, actually believed The Lion King was a Disney retelling of Kimba. However, Disney’s official stance on the matter was that the similarities were merely coincidental. The Lion King was celebrated with numerous accolades. John and Rice won an Oscar for “Can You Feel the Love Tonight”, with “Hakuna Matata” and “Circle of Life” also landing nominations. Composer Hans Zimmer received an Oscar for his musical score. At the Golden Globes, John, Rice, and Zimmer were likewise honored for their music, while Hahn earned a statue for producing the Best Motion Picture – Comedy/Musical. 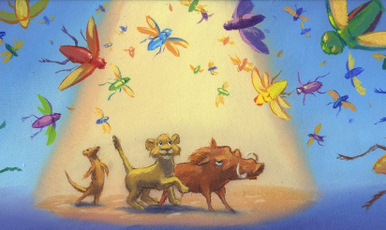 The Annie Awards selected The Lion King as the Best Animated Film of 1994, and also honored Brenda Chapman for her story. Disney Theatrical considered adapting The Lion King for Broadway, as they had successfully done with Beauty & the Beast in 1994. Allers and Mecchi wrote the book for the musical, which featured new music by John, Rice, and Lebo M. Directed by Julie Taymor, The Lion King opened on November 13, 1997, at the New Amsterdam Theater. 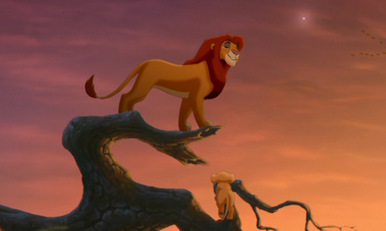 Like its animated predecessor, The Lion King won numerous accolades among its critical acclaim. The show received six Tony Awards, including Best Musical. Taymor was honored for her direction and costume design, the latter with Michael Curry. Garth Fagan earned a Tony for his choreography, as did Richard Hudson for his scenic design and Donald Holder for his lighting. Interestingly, much of the talent who transferred from the film to the show were left with only nominations, including Allers and Mecchi. Other nominees included the Best Original Score team of John, Rice, Zimmer, Lebo M, Taymor, Mark Mancina, and Jay Rifkin. 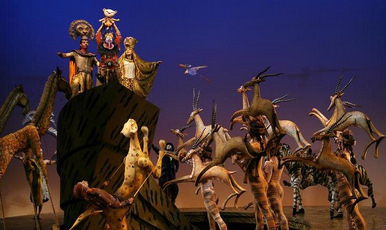 The Lion King would go on to deliver 5,754 performances by September 25, 2011, becoming the seventh longest-running show on Broadway. Disney wanted other ways to extend the Lion King franchise. The same year the film broke box office records, the studio found another goldmine: direct-to-video films. Hitting store shelves on May 20, 1994, the Aladdin sequel Return of Jafar was expected to sell two million copies total. Instead, it sold nearly 11 million copies, collecting close to $100 million. Meanwhile, The Lion King arrived on VHS on March 3, 1995, ultimately selling 32 million copies to become the top-selling VHS title of all time. 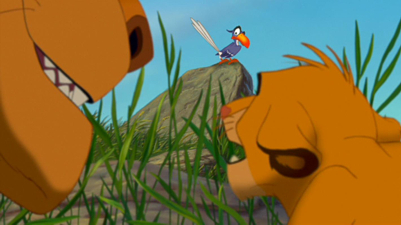 Thus, DisneyToon Studios began production on a direct-to-video sequel to The Lion King. 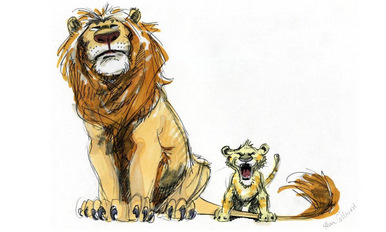 Directed by Darrell Rooney and Rob LaDuca, The Lion King II: Simba’s Pride hit store shelves on October 27, 1998. 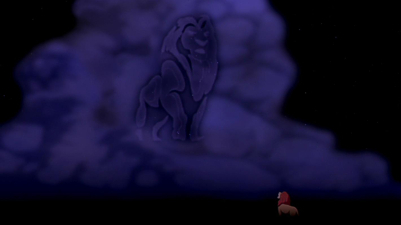 With a plot loosely inspired by Romeo & Juliet, the sequel also followed Simba’s parental relationship with his cub, seen briefly in the first film. Many viewers were caught off-guard when the cub was revealed to be a girl, Kiara. 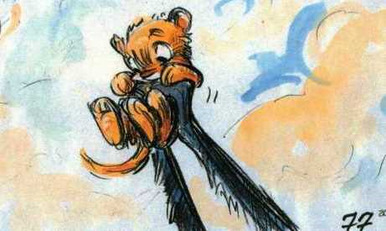 After all, Disney had portrayed Simba’s cub to be a male, Kopa, in the 1994 book anthology The Lion King: Six New Adventures. Minkoff and Allers, having created the cub for their own film, were likewise surprised by the revelation. “It was not our idea that it was a female cub,” said Minkoff. 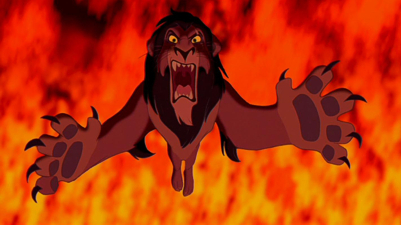 “They decided they needed a different angle on the story.” Disney sold more than 13 million copies of Simba’s Pride. Around the same time, Disney began to show interest in IMAX, a theater format with a screen size, resolution, and sound far greater than that of a typical cinema. On January 1, 2000, the studio released Fantasia 2000 for an exclusive run at the theater chain. By the end of its four-month engagement, the film had gathered $64.5 million – a respectable total but nowhere near the usual gross a Disney animated feature made in regular theaters. But Disney realized another way to utilize IMAX. Rather than release new films in the format, the studio used IMAX to re-release classics, offering audiences a new way to experience some of their favorite films. Beauty & the Beast was the first of these re-releases, treated to an extensive restoration. Hitting IMAX theaters on January 1, 2002, Beauty also contained a new musical sequence, Human Again, which had been deleted from the film’s original release. By the end of its IMAX run, the film had added $25.5 million to its lifetime domestic gross, bringing the total to $171.4 million. 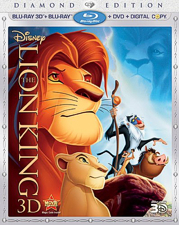 On October 7, 2003, The Lion King arrived on DVD, moving more than two million copies. Its marketing was used to herald the film’s next sequel – or, in this case, “inter-quel.” In The Lion King 1 1/2, Timon and Pumbaa revisit the first film, explaining how the meerkat and his porcine pal were actually involved much more than audiences realized. The film seemed loosely inspired by the Tom Stoppard play Rosencrantz and Guildenstern Are Dead, which showed the title characters in every major event of Hamlet. Unlike Simba’s Pride, The Lion King 1 1/2 had more involvement from the behind-the-scenes talent of the original classic. “Irene Mecchi and I would go to the story meetings at the Frank Wells Building, for the video division,” said Allers. 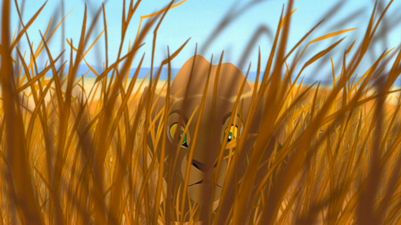 “We worked with them, made suggestions, came up with gags – that sort of thing.” When it hit stores on February 10, 2004, The Lion King 1 1/2 received arguably the best reviews for a Disney direct-to-video sequel, including a 79% approval rating at RottenTomatoes.com. 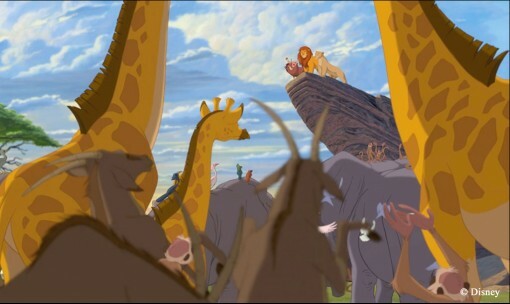 Like Simba’s Pride, the film won the Annie Award for Best Animated Home Entertainment Production. During the mid ’00s, Disney became enamored with 3D. The studio experimented with James Cameron’s documentary Ghosts of the Abyss (2003) and the animated flick Chicken Little (2005). Certainly, audiences were intrigued by new releases being shown in 3D. But Disney wondered how they would respond to classic titles being re-released in the format. On October 20, 2006, the studio issued The Nightmare Before Christmas in 3D to theaters, beginning an annual event. In its first 3D release, Nightmare collected $8.7 million. In 2007, it grossed $14.5 million, followed by $1.1 million in 2008. Simultaneously, other studios began utilizing 3D to increase earnings for their films. In 2010, the format reached an all-time high of popularity, helping Cameron’s Avatar and Disney’s Alice in Wonderland achieve worldwide totals of $2.8 billion and $1 billion, respectively. With a history of successful theatrical re-releases, Disney decided to try their next ambitious 3D effort, converting a traditionally animated classic. For this process, the studio went with the same lineup as their Broadway and IMAX ventures: Beauty & the Beast, followed by The Lion King. Roughly four months later, Minoff and Allers were pleased with the conversion. “I thought it worked really well,” praised Allers. Box office returns suggested audiences agreed. The Lion King 3D was released nationwide on September 16, 2011, scheduled for a two-week engagement. Analysts’ expectations for the first weekend were modest, predicting an opening less than $15 million. Instead, The Lion King 3D became the top film at the box office for two weeks, with $30.1 million and $21.9 million. Disney responded by extending the film’s theatrical run. 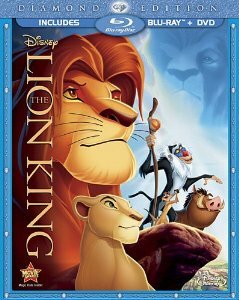 On October 4, 2011, The Lion King made its grand debut on Blu-ray. 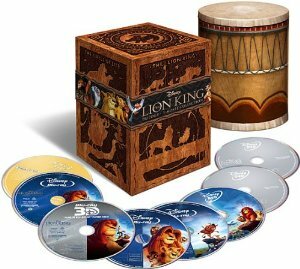 Simba’s Pride and The Lion King 1 1/2 were likewise released, albeit only in a trilogy package. The 3D Depth Map created by Robert Neuman, the 3D Stereographer on the film. Positive numbers refer to the pixel amount the image will come out of the screen. Negative numbers refer to the pixel amount the image will go deeper into the screen. 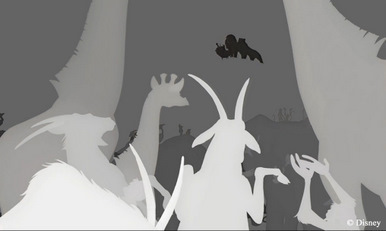 Grey Scale – The final image in the computer representation of depth. The darkest images will be furthest away. The lighter images will be closer to the viewer. is now available to own. Special thanks to Roger Allers, Rob Minkoff, and Darrell Borquez at WDAS! “Minkoff and Allers at the The Lion King 3D premiere” photo is courtesy of Kevin Winter / Getty Images North America.